With summer banging at the door and your bike straining at the leash for some mega-miles, we ask our favourite bike racers, equipment experts and pundits for their tips, anecdotes and what-not-to-dos for enjoying the warmer weather. It’s not just your lungs that gasp for air when you cycle, often it’s your whole body. A long summer day in the saddle can go from marvellous to miserable when combined with heat, humidity and bad clothing. With this in mind, help your body out by making sure you grab a lightweight, breathable jersey – the best of which utilise quick-dry, porous fabrics to wick away the clinging sweat. Different brands have different terminology, but it’s this ‘wicking’ property that you definitely want on your jersey specs list. Grace Metcalf, Women’s Business Manager at the all-conquering American bike brand Specialized, attests to the importance of these kinds of fabrics. The equivalent tech in Assos products is referred to as Dual Tex and can be found on products like their hyper-lairy UMA GT jersey, while Rapha’s bells-and-whistles hot-weather merino is referred to as RPM150 and is employed in their Classic II jersey. Great news for sweatier riders, with science finally working in your favour. 2. To base layer or not to base layer? The tip-top, best base layers also come with specialist, anti-bacterial fabrics – allowing for a simple rinse, dry and repeat after a long day in the saddle. 3. Drink, drink and drink again. You can never drink enough water when out on a long, warm ride. The classic rule is 475ml to 825ml (or about one bidon) every hour, so make sure you keep supping away and have an eye out for the next likely refill spot. Even better, plan a series of strategically spaced café stops to get your much-needed hydration fix. You can opt for whatever liquid suits you best, but good ole’ water is often the best choice. We can’t oversell the benefits of a refreshing, sugary beverage once in a while though, with presenter, journalist and regular Casquette contrib, Laura Winter (pictured above) owing a few thanks to Orangina in particular. Cycling shorts without bib straps have some obvious, pee stop-related advantages, but they also have some downsides, particularly on hot, sweaty days. To avoid the ‘builder’s bum’ effect that can occur as your shorts get damp with sweat and slip out of place, bib shorts are a necessity. 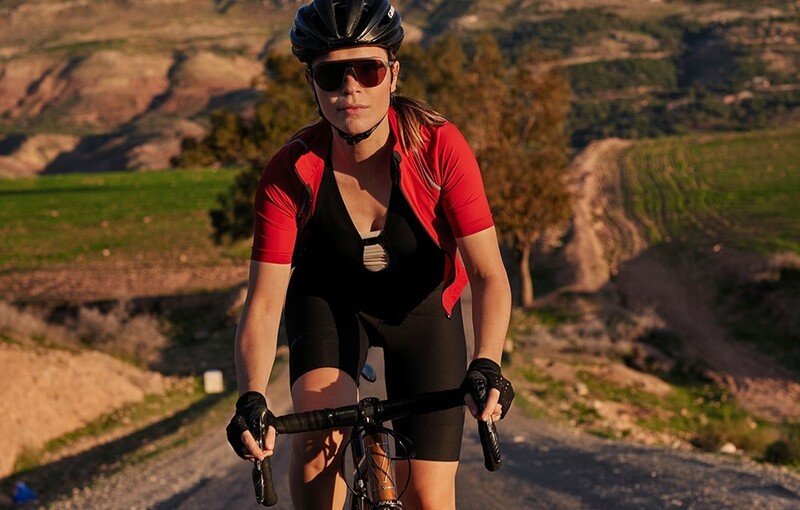 Grace chips in again to remind us to, “make sure they come with UV protection as most fabrics do not protect the skin against harmful UV rays.” Specialized’s RBX Comp bibs make use of their proprietary Deflect fabric, with a UV protection factor of 50. Japanese brand, Pearl Izumi, also offer a similar sun-protecting pair of bibs, which they call Elite Pursuit. For more bib short inspiration, we took some quick-pee versions for a test drive with Lorna North. Here are the results. Speaking of that sweet, sweet UV protection – a long day pedalling away under a blazing summer sun is no different to one spent lounging on the beach. Either way, you have to take safety measures to protect your eyes and your body’s largest organ: your skin. There are a whole bunch of cycling-specific sunglasses out there, combining practicality with the most recent trends. A pair of shades that sit well on the head and provide 100% UV protection are just as vital as setting out with your jersey on and helmet strapped. In other words, make wearing them a habit from which you never waver – even when the sun chooses to dip behind the inevitable cloud. Rapha’s Pro Team Flyweight are pretty damn flash if you can cope with the price tag, while SunGod’s PaceBreaker model have the best quality lenses we’ve ever seen (through). No discussion of sunglasses would really be complete without mention of Oakley, whose JawBreaker design has become ubiquitous among both pros and amateur wannabes alike. We prefer their wayfarer-style Reverie model though (pictured) – a pair of shades you might actually wear off the bike as well. The unwavering stream of heat from a summer sun at the height of midday is enough to make anyone wish they had their head dipped in an ice bath – rather than slowly cooking inside a plastic lid. If you’re struggling to stop your brain from frazzling, you may have just come out rocking the wrong headgear. A helmet is essential, no matter the distance, the terrain or the experience – but make sure you’ve always got the right one for the job. A well-vented, lightweight helmet like Specialized's Aspire is perfect for a long summer ride. And a spacious hair port system at the rear an added bonus to keep that ponytail floating on the summer breeze. MET’s Trenta 3K Carbon – as worn by British pro team Trek Drops – combines peloton styling, impressively light weight and something called the Venturi Effect to cool your noodle. There’s nothing worse when riding your bike than a swarm of blisters covering your palms. And let’s face it, the warm weather coupled with rough, rubber bar tape is enough to turn any hand into a dry, cracked mess. That’s why, despite the rising temperatures, mitts are an item of clothing that should never be left at home. Not to mention, they also give your hands some much needed protection during the occasional slip. Specialized’s Grail mitts will do the job, as will these bargainous B’Twin options from Decathlon, or these from the always-on-point Cafe du Cycliste. Laura Winter adds allergy meds to the essential items on our growing list. The effects of hay fever are certainly not something to be underestimated, neither is heat rash, nor the (surprisingly common) allergy to grass. Anti-histamines will help relieve the uncomfortable symptoms of all these and repair your relationship with the summer. If you’re like Laura and allergic to your own sweat, anti-histamines could just save your body from destroying itself on long, sweat-inducing adventures. With the UK renowned for throwing in the occasional showery surprise, it’s worth taking a quick look at the weather before you set out so that you know whether you need to pack both the sunscreen and a light rain jacket – this is the UK summer, not the Costa del Sol, after all.